If elevated cholesterol is not a marker for arterial narrowing, then what is it a marker of? This is largely due to the rising consumption of refined sugar, in particular high fructose corn syrup, and carbohydrates (bread, rice, pasta) which turns to fat and cholesterol. Fatty liver was a rarity decades ago. 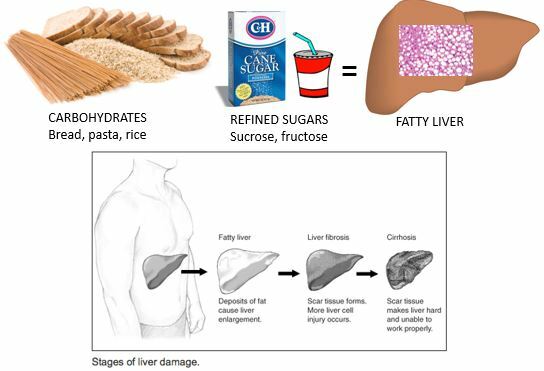 But now that so much refined sugar and carbohydrates (bread, pasta and rice) are consumed, 35% of Americans have a fatty liver condition that is not related to over-consumption of alcohol. When it comes to the modern diabesity epidemic, all roads lead to fatty liver disease, not cholesterol per se, though elevated levels of cholesterol emanate from fatty liver disease, not the other way around as mistakenly believed. Examine the evidence below linking obesity, diabetes, gout and cardiovascular disease with fatty liver. We have to go back six decades to when Dr. Samuel Zelman published his first study that connected fatty liver to obesity. That was in 1952. Dr. Zelman observed fatty liver in a hospital worker who drank 20 Coca-Colas a day which provided an obscene amount of sugar —1600 milligrams per day, equivalent to drinking a pint of whiskey per day. So he set out to study this problem. It took Dr. Zelman a year and a half to find 20 obese subjects who were not alcoholics. All of his obese subjects had some degree of fatty liver. All of Dr. Zelman’s study patients preferred carbohydrates (bread, pasta, rice) over protein in their diet. [AMA Archives Internal Medicine Aug 1952. Examine the remarkable volume of published science showing choline, a common nutrient provided in eggs and other foods, is the antidote to what ails modern man. 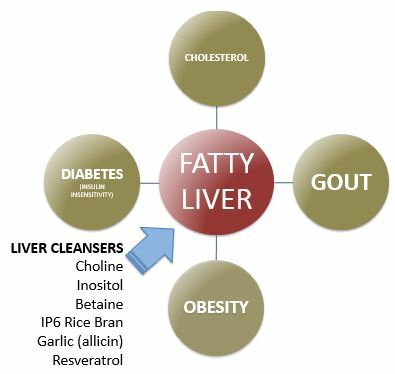 Seven natural molecules that are reported to help control fatty deposits in the liver and blood circulation are choline, inositol, betaine, methionine, rice bran IP6, garlic (allicin) and resveratrol. [Biochemistry Journal April 1951; Anticancer Research 1999; Lipids Health & Disease 2010; World Journal Hepatology April 2014] All are widely available as dietary supplements. The demand for choline increases among women whose estrogen production is in decline. [Current Opinion Gastroenterology March 2012] That is precisely when women experience a rise in circulating cholesterol. The PDR For Nutritional Supplements notes that lecithin (phosphatidylcholine) supplements provide choline but only provide 13% choline by weight (4230 mg lecithin provides 550 mg choline). As already stated, eggs are a rich source of choline. That modern medicine shunned egg consumption makes one wonder if doctors were intentionally creating a recipe for more disease to treat. Since the 1930s it has been known that fatty liver disease, fomented by refined sugars and carbohydrate-rich diets, is central to the ongoing diabesity epidemic (diabetes, obesity, heart disease). One of the most renowned biologists, Charles Best, discovered that choline abolishes fatty liver disease and that discovery was thrown in the closet as the cholesterol theory of heart disease and the statin drug paradigm prevailed over the past four decades. Modern society has paid a terrible price for modern medicine’s proclivity to prefer prescription drugs over proven natural remedies. Both historical and modern science confirm choline, betaine, inositol and other available dietary supplements are undeniable antidotes to what ails modern man. ©2015 Bill Sardi, Knowledge of Health, Inc.